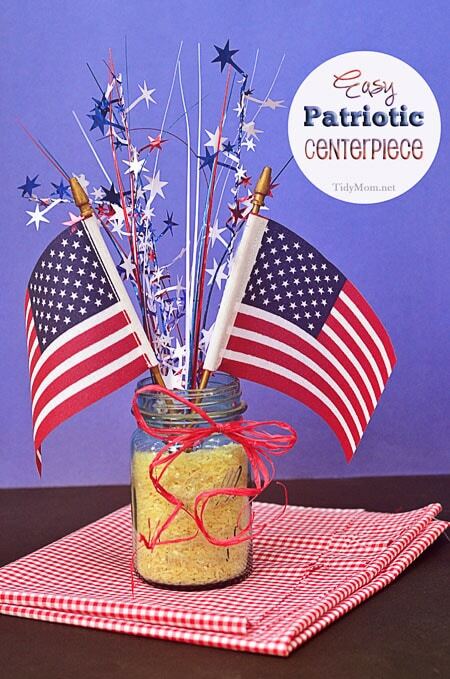 Make an easy DIY rice filled jar for a Memorial day or 4th of July Patriotic Centerpiece. 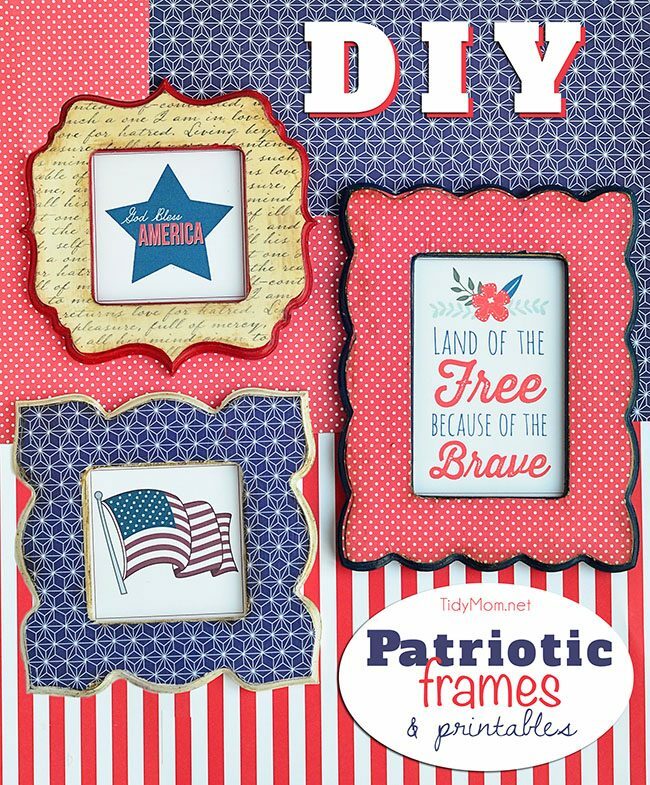 A patriotic project the kids can help with. I’ve never been one to do any decorating for Fourth of July, other than hanging a flag from my front porch. 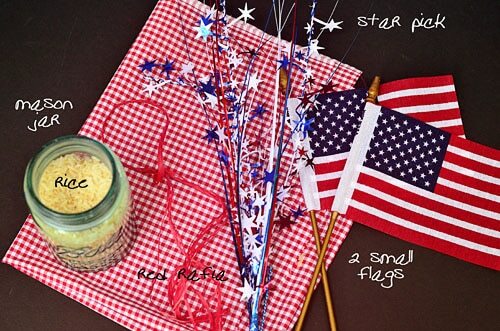 But I picked up a few little flags and a star pick the store after I was inspired by Kim’s cute Red White and Blue Jars. My original intention was to make patriotic colored rice, but since I had an empty blue mason jar staring at me, I got a little lazy and figured, white rice would be great in a blue jar. I could just tie a little red raffia around the neck! I stuck my stars and flags in the rice and Bazinga! I had a cute little Patriotic Centerpiece in two minutes flat! I love how cute it looks in my kitchen window and how simple it was! With all this horrible heat we are having, it may be the closest thing to fireworks I’ll see this year! 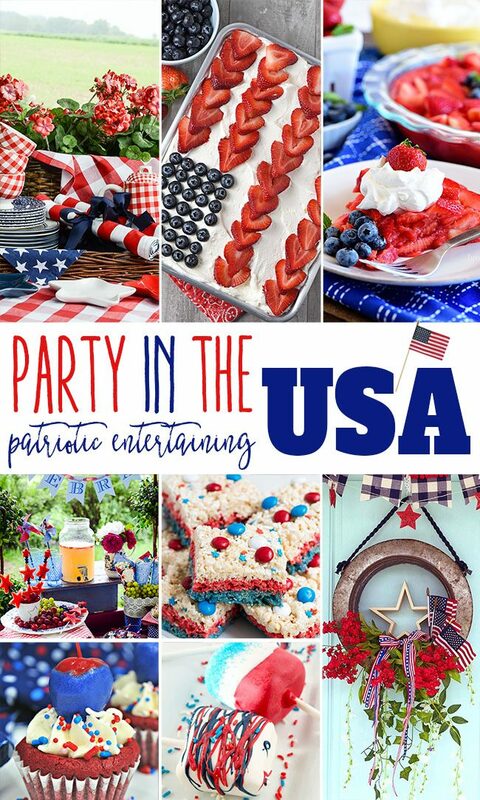 Exceptional patriotic themed entertaining ideas and recipes our founders would be proud of. Hi Cheryl! Thanks so much for hosting us!!! I LOVE your centerpiece idea. My family and I just had a discussion tonight about 4th of July plans…. and I am not that crafty, but want to have a festive table. I’m definitely gonna try my hand at these. Thanks again for hosting us!!! Thanks for hosting Cheryl! 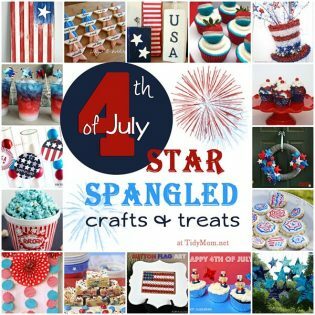 Have a fabulous fourth of July! I’m totally loving that centerpiece! So simple and I have almost everything I’d need already. Perfect! Thanks so much for hosting Cheryl! 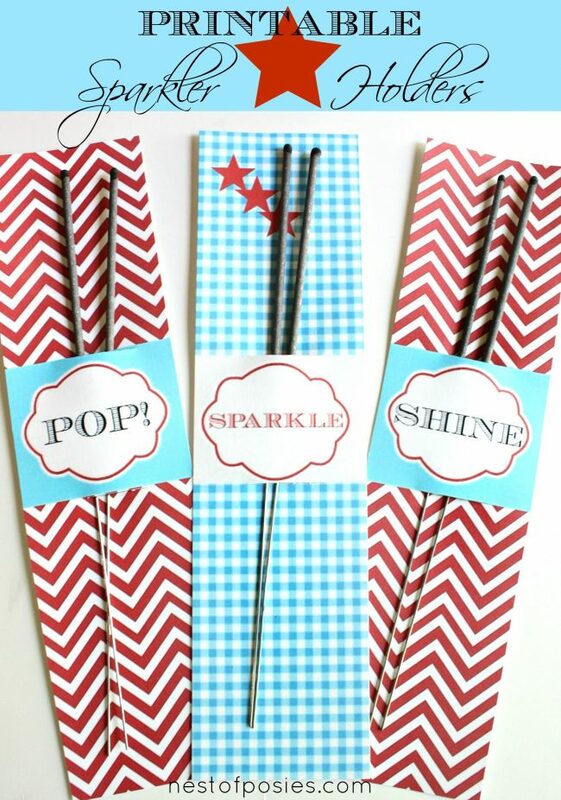 Great centerpiece and easy to assemble and then put away! Thanks for hosting. Thanks for hosting, Cheryl! I hope you have a great 4th of July! I think that centerpiece would make a great gift for my Mother-in-Law who is hosting the 4th of July BBQ. Thanks for hosting! I love you centerpiece. 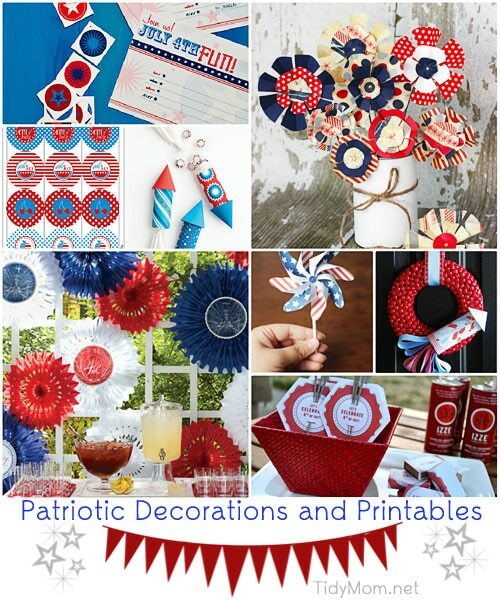 I definitely need to work on some kind of patriotic decor in the next few days! I’m running out of time! How CUTE is that centerpiece! I saw some little flags like that at the hardware store today and wondered what I could do with them! Happy 4th of July!! You are welcome to send some of that “terrible heat” my way! We have had so much rain and cool weather we are dealing with floods around here. I need some sun!! Cute centerpiece Cheryl. Thanks for hosting!! What a fun and simple centerpiece!!! Thank you so much for hosting!!! Our entire state seems to be on fire as you may have head in the local news (with one fire blazing for over 2 weeks now) so we absolutely will have no public or personal fireworks this year. Though we don’t necessarily go to large public displays, it seems odd not to see any in the sky. 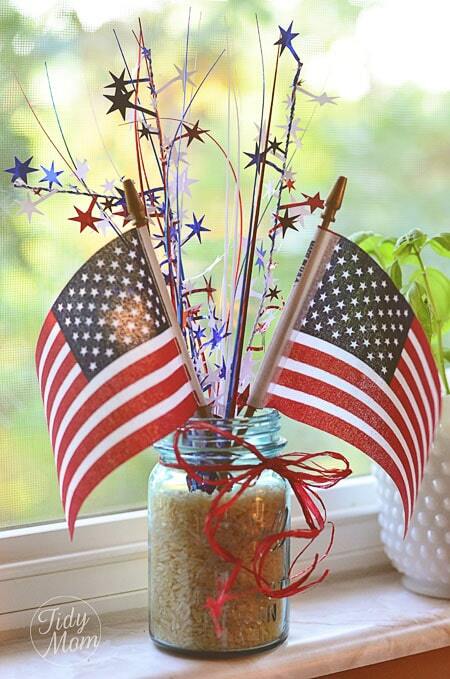 The pizazz of your little centerpiece conveys the excitement of fireworks to me! And I can view it from the inside of my air conditioned home! Very cute Cheryl. that’s so scary!!! praying you all stay safe and they get the fires out soon!! So cute and Easy Cheryl! Thanks for sharing! That is really nice Cheryl, I love easy, pretty + festive! I really should plan to eat a snack while linking up. Look at all those goodies! Your centerpiece is adorable, Cheryl! Thanks so much for hosting… I just linked up two summertime recipes. I love this centerpiece! So festive and colorful. 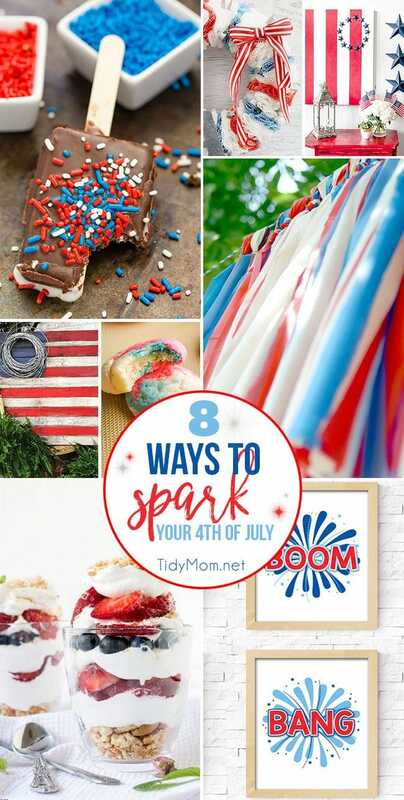 I hope you’ll link it up to my Patriotic Project Parade! definitely loving that centerpiece idea! Such a cute idea, Cheryl! I just love browsing through your Link Up Parties! 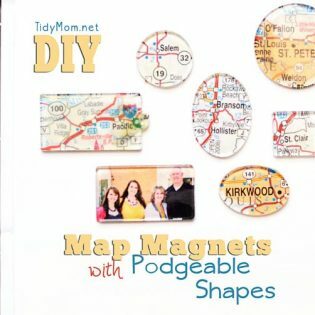 very fun & seems easy to do!